For those of you who don’t know me, I’m not much of a cook. Translation: I hardly know how to boil an egg. So I am totally not the kind of person to seek out cookbooks, but “Masala Dhaba” is totally different. Firstly, it is written by Michael Swamy, an absolutely charming, low-key, modest man I have met on a couple of occasions here in Delhi. I wrote a story about Michael when he opened a Latin American restaurant, “Nueva” here in Delhi, and I follow him on social media, but that’s as far as it goes. I didn’t even know he’d written this cookery book until I was asked whether I wanted to review it by the publishers, Om Books International. So there you have it, full disclosure – including the fact that I am not a “food” person at all. But this book might just change all that. 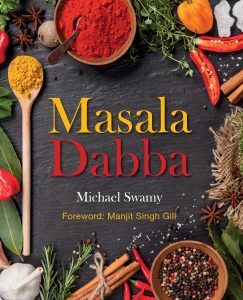 Michael Swamy has not only created the recipes in this elegant, attractive book, he has photographed them, too. The book is a visual treat, absolutely gorgeous. And the recipes, my dears, the recipes. They are readable, simple, and brilliant. What Chef has done is to take the traditional Indian spice “dabba” and turn it inside out, blending, mixing and re-thinking old favourites. Chef takes familiar dishes and re-invents them, by using unusual spices, contrasting & unusual combinations, slightly different flavours, by pairing contrasting tastes. On the day the book arrived from the publisher, I sat down and started reading it (truly I did. 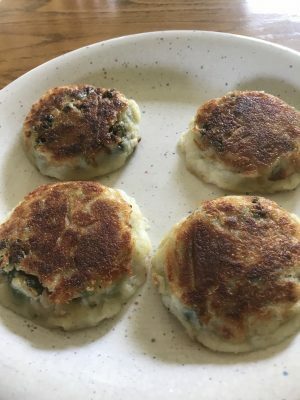 Cross my heart and hope to die) and almost immediately came across Chef’s recipe for “Aloo matar tikki aur kurkuri bhindi” (everything is translated into English, by the way). 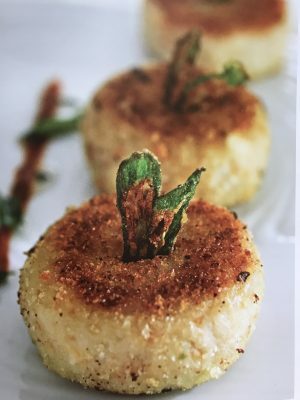 Now aloo tikkis are something I learned to enjoy in my Mumbai days, years ago, and we thought we knew how to make them. My husband is half Sindhi and so his rellies always claim tikkis are typically Sindhi, and that they all know how to make them to perfection. Well…Chef’s version was tikkis with a twist, let me tell you. We’ve made it a couple of times since and it is set to become a new staple. You have to excuse the photography, by the way. I’m a photographer, as it so happens, but not a food photographer and food stylist, like the talented Chef Michael. Not for nothing did I describe Chef as a “renaissance man” in my article – creating, cooking, writing, styling, photographing – he does it all. But, joking aside, these “tikki”s were delicious. We have also tried and enjoyed the “chhole aur jau ka pulao” (chickpea and barley pilaf) and there are loads more recipes earmarked for trying. Re the pulao recipe I just mentioned – there are just 5 steps in the cooking. Well 4 actually, since the 5th instruction is “Serve hot with raita”. For a non-cook like me, I don’t find this book in the last bit intimidating. Recipes are succinct. The instructions are clear and uncomplicated. And some of the combos are amazing sounding – yogurt chilli pepper cupcakes anyone?! As well as a host of interesting recipes just begging to be tried, there is a section telling you how to make your own masalas, and lots of useful definitions. For our complicated household – vegetarian/no meat but fish/no fish but meat, this book is a godsend. As I mentioned at the outset, I was sent a copy of the book by the publishers, but am under no obligation to write a review. But having read this cookery book, loved it, & already bought 2 copies to give to friends, I thoroughly recommend it. Here you go. A link to buy it online.